Two horizontal spindles with 94 kW driving power – guaranteeing maximum stock removal! 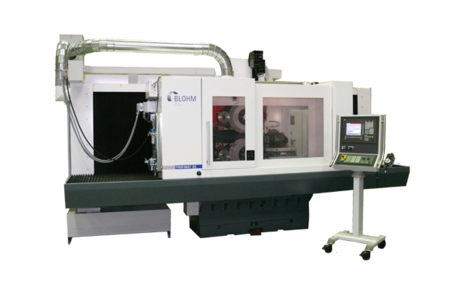 With the PROFIMAT 312 DK, the PROFIMAT series is supplemented by a production machine with an extremely high metal removal rate. It tackles grinding tasks from 2 sides simultaneously. The machine is excellently suited for grinding retaining gears (fir-tree profiles) on turbine blades in particular, as the normal forces are compensated during the double-sided machining. The profiles do not have to be identical: Because there is a separate dressing device for each grinding head. This allows the machining of different profiles. In comparison with conventional grinding processes, the grinding time is more than halved with this method.